As part of its transformation to deliver a more affordable, clean energy future for Hawai‘i, the Hawaiian Electric Companies are proposing a new program to increase rooftop solar in a way that’s safe, sustainable and fair for all customers. The program will solidify Hawaii’s position as a national leader in a growing movement to develop clean energy financing solutions. GEMS is designed to help meet the state’s ambitious renewable energy and energy efficiency goals by using public dollars to mobilize private-sector capital in a way that stimulates the growth of Hawaii’s clean energy economy. A new farm was blessed Saturday (March 23) in Puna but unlike farms using the soil beneath our feet it harvests the power of the sun above our heads at the Pohoiki Photovoltaic Solar Farm. Hawaii Energy, the state energy conservation and efficiency program, will be ending its $1,000 solar water heating incentive for cash purchased systems this Wednesday as funds have been exhausted. 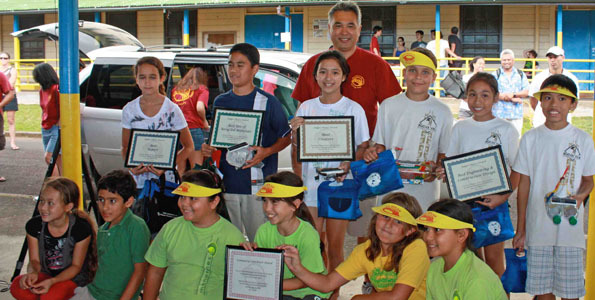 Hawaii Electric Light Company (HELCO) held its fourth annual Solar Regatta on May 14, 2011 at Hilo Intermediate School. This year, more than 200 fifth graders from eight schools participated in the event.